Pool is a fun and competitive game. And just like all competitive sports, if you want to excel in pool you will need to dedicate hours to mastering your skills. This mastery only comes through practice, however, and because you will not always have an opponent with whom to practice, it’s imperative that you know some drills and practice tips that you can do by yourself to increase your skill set. To help you do this, below we have outlined several drills and practice strategies designed to make you a better pool player—drills and strategies you can practice all by yourself and without an opponent to play. When trying to master the game of pool, also known as billiards, there simply is no substitute for regular, consistent, quality practice. According to the experts in the game, the only true way to advance your game is to spend a lot of time executing what you have learned in practice. If you can master the techniques in practice, you’ll be more than ready to use what you have learned when you need it in actual match play. Stroke drills are those drills that ensure you’re aim is true on the pool table. Here we have elaborated on three separate stroke drills. The basis behind this first practice stroke drill is to determine if you have a straight stroke—a must when trying to play competitively. For this drill, the first thing you will need to do is place the cue ball on the head spot (at the opposite side from which you would rack the balls). Once the cue ball has been placed on the head spot, you are going to grab your pool cue and aim straight at the second diamond on the other end of the pool table—the diamond in the middle of the back rail. Make certain that you aim at the cue ball without any English or type of spin on it. Then, when you are ready, shoot the cue ball towards the second diamond on the far end. If your stroke is true, the cue ball should hit the rail and go back on the same straight path that it came from and return towards the head spot where the cue ball was originally placed. Any error in your stroke will show right away after the cue ball hits the rail. If any spin is inadvertently applied on the cue ball, it will not come back in a straight line towards its initial position on the head spot. Although this drill sounds easy enough, you might be surprised by the results. However, do not become frustrated if this drill does not immediately produce perfect results. Even shooting the cue ball straight from long distances can be difficult, which is why it is so important to practice this drill regularly. In other words, you should shoot this drill about 20-30 times a day until you get to at least a 90 percent accuracy rate—9 times out of 10. The second stroke drill we are going to talk about is a little more complicated. It is also the ultimate test of your true stroke. For this drill you are going to place an object ball (1-15) on the rail, right up against the second diamond from the top right corner pocket. Once there, place the cue ball on the same vertical line from the object ball. Using your pool cue, you are going to aim at the object ball, again without giving the cue ball any English or spin. Aim at the exact center of the object ball, and then shoot. Similar to the results in Stroke Drill #1, the cue ball should go back in a straight line towards the position from which it started. When shooting this popular drill, any error you make will be immediately visible. Because you are hitting a round ball with another round ball, unless the cue ball strikes the object ball dead center, it will be impossible for the cue ball to return in a straight line. Rather it will scatter in another direction, along with the object ball. Once you attempt to do this drill you will see exactly what we mean. This drill is not an easy one, but once you perfect it you will be well on your way to a perfectly straight stroke. For starters, try shooting this drill every day until you are able to achieve an 80-85 percent accuracy rate. In the final stroke drill, place an object ball about 8 inches away from one of the corner pockets and line it up exactly with the center of the pocket. Next, draw an imaginary diagonal line between the object ball and the corner pocket that is directly diagonal to it. First, place the cue ball about 4 inches away from the object ball, and practice hitting the object ball into the corner pocket. Continue to do this until you have achieved a 100 percent accuracy rate. When you have mastered this straight-on shot from four inches, move the cue ball back another four inches and repeat the drill. Continue shooting from this eight-inch distance until you have achieved a mastery rate of about 95 percent. After achieving mastery from 8 inches, you are going to continue the drill, first by shooting from 12 inches away and finally by shooting from 16 inches away. For each of these drills you should achieve an accuracy rate of 85 and 80 percent, respectively. When shooting this drill from any distance, your stroke—if it is straight—should have no problem consistently knocking the object ball into the corner pocket. Always take note of your misses, as this enables you to determine exactly what is wrong with your stroke. If the object ball misses the pocket and goes towards the outer left side of the pocket, then your stroke is off to the right. This means that you are hitting the cue ball on the right side of its center spot. If the object ball misses and goes towards the outer right, then you are hitting the cue ball to the left of its center spot. 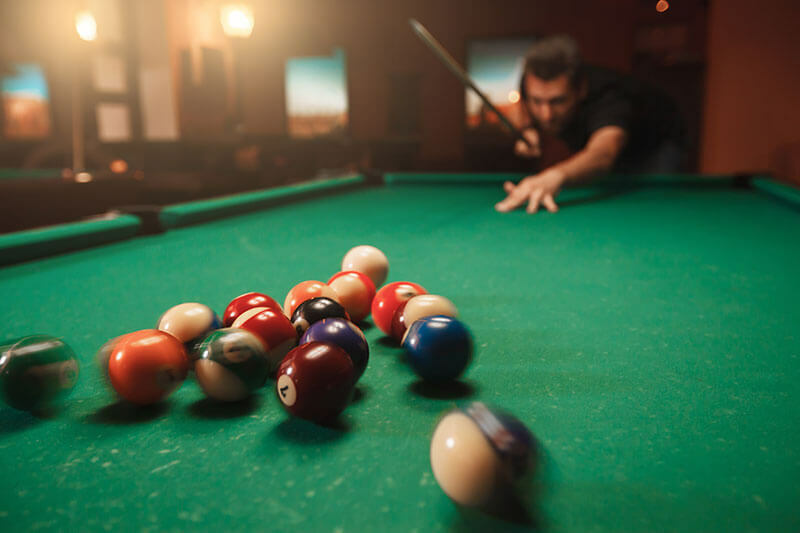 You should also keep in mind that as the distance between the object ball and the cue ball increases, the difficulty level of the shot also rises. This is a no brainer. However, if your stroke is perfectly straight, the distance should not matter. By hitting the exact center of the cue ball and rolling into the exact center of the object ball the results will always be the same: the cue ball will go into the pocket. If this is not happening, your stroke is off and needs more practice. The first thing you need to do when setting up the concentration drill is to line up all 15 object balls in order across the center of the table—the horizontal side of the table. Keep in mind that for this drill, each new shot you take will be “ball in hand,” which means you can re-place the ball at the end of every shot. With the object balls lined up across the center of the table, place and aim the cue ball for a straight in shot to the corner pocket at about the first diamond behind the string of object balls, starting with object ball number 1. Keep in mind that as your aim becomes more true you can always increase the distance by moving the cue ball further back. Using a straight-in placement and aim with each new shot, proceed to pocket the 2-ball through 8-ball into the same corner pocket in which you shot the 1-ball. Then, using the same aim and placement, pocket the 9-ball through the 15-ball into the other corner pocket, making sure each new shot is straight-in. This drill may sound easy enough, but here’s the catch. If you miss even one of the 15 balls that you shoot, you must line ALL the balls back up and do it again. And you must continue to do this every time you miss a shot. Naturally, the object of this drill is to pocket all 15 balls without missing. Once you can do this on a consistent basis, you can continue with this drill and make it even more difficult by moving the cue ball back, thus increasing the distance it must travel before striking the object ball. Being perfect with all 15 balls requires a lot of concentration and perfect fundamentals. That is why this is such an important drill to work on. The Concentration Drill helps give you a better feel for the game and simulates having to pocket balls when under pressure. It also helps tremendously when trying to develop a smooth, straight stroke.